Volkswagen Caminhões e Ônibus’ newest manufacturing partner in its Resende (RJ) vehicle plant is the German-owned company Kroschu (Kromberg & Schubert). The company has now become a member of the Modular Consortium production system and is responsible for the finishing of truck cabins following the building and painting stages, and before they are mounted on the chassis. For this operation, Kroschu is replacing Continental in the consortium. On January 2, 2019, and following a carefully executed six-month transition period, the employees working on this operation joined the Kroschu team. 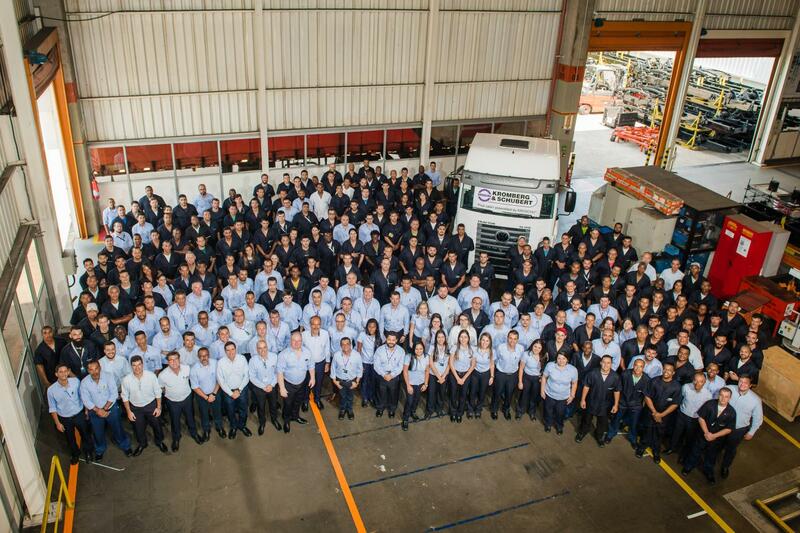 Continental remains as a supplier of tachographs, dashboards and electronic modules for the trucks and buses made in Resende (RJ). “The Modular Consortium is one of Volkswagen Caminhões e Ônibus’ main assets and is largely responsible for our success, in particular for the flexibility it gives us and for the excellent access these major suppliers have to the world’s vehicle market,” says Roberto Cortes, President and CEO of Volkswagen Caminhões e Ônibus and a Board Member of the TRATON Group. He goes on to say: “We have already achieved excellent results over the last 22 years, and I am convinced that the partnership with Kroschu will be really productive.” With a long tradition of supplying wiring harnesses to the company, Kroschu’s new activity will build a close partnership with Volkswagen Caminhões e Ônibus and the other six partners which form the Modular Consortium, an innovative manufacturing concept whereby the member companies divide the responsibility for manufacturing trucks and bus chasses with Volkswagen Caminhões e Ônibus. Kroschu’s integration into the operation was made easier by the company being very familiar with the VWCO corporate culture. “This new opportunity consolidates our long relationship with Volkswagen Caminhões e Ônibus. We know that one of the Modular Consortium’s secrets for success is the strong partnership between the different companies involved and we are optimistic about both the contribution we can make and the results we will achieve”, says Michael Kerner, Administrative and Financial Director for Kroschu in Brazil.